According to Internet Live Statistics, Google sees almost 67,000 searches per second. In the time it likely took you to read that first sentence, Google executed almost a quarter of a million searches. With such a huge number of people searching, there’s absolutely no question that you want your practice showing up on the results pages when potential patients are searching. The question is: how do you optimize your healthcare practice website for search? The bad news when it comes to search engine optimization (SEO) is the heyday of easy rankings with SEO tricks (keyword stuffing, hidden links & content, etc) has passed. Google has gotten too good at processing content and understanding what users actually want and SEO has only gotten more competitive. The good news is, as SEO has gotten more competitive, the tools available to help with SEO tasks have also gotten better. In fact, if your medical practice has a relatively modern site built on WordPress, a content management system that makes building and maintaining a website extremely easy and powers about 30% of the internet, we have 5 great plugins that can produce effortless SEO for doctors. Why Do Doctors Need an SEO Plugin? While WordPress on its own does some essential SEO tasks automatically, many SEO-specific plugins, which are software developed by third parties that can be added to WordPress to expand its functions, exist that can make more advanced SEO for doctors nearly effortless. Can you get by without the plugins? Certainly, but not only would you be increasing your workload, you’d have to know a lot more about WordPress than the average web developer in order to completely replicate some of the functions these plugins handle with one click. With several free and easy to use options available, you really are missing out if you don’t install at least one SEO plugin. What Makes a Good SEO Plugin for Doctors? The primary feature you want to see in an SEO plugin for healthcare websites is robust documentation and recommendations for settings. From enabling new search features like Accelerated Mobile Pages to integrating tools like Google Search Console and Google Analytics, a good SEO plugin will not only offer the tools, but will also help you set them up correctly. We’ve outlined some of the key features you should look for in a plugin and there are a few terms worth understanding before you install it. To summarize, a good SEO plugin can make suggestions for how you can optimize your site for great SEO, provide feedback on how well optimized your site actually is, and offer features to actually optimize your site content like title tags, meta descriptions, page speed, content formatting, and more. The good news for the cost conscious doctor is the most popular SEO plugin for WordPress is free. Yoast SEO, with over 4 million users, is one of the best SEO plugins for doctors. With its generally intutive interface and helpful explanations, it is great for beginners and advanced users alike. Yoast offers some additional free features over the other free options that make it stand out from the pack, like the “traffic light” indication providing real time analysis of content to help you create posts that are well optimized and easily readable. Additionally, a premium version of the plugin is available that provides added options like automatic internal link recommendations and redirects. 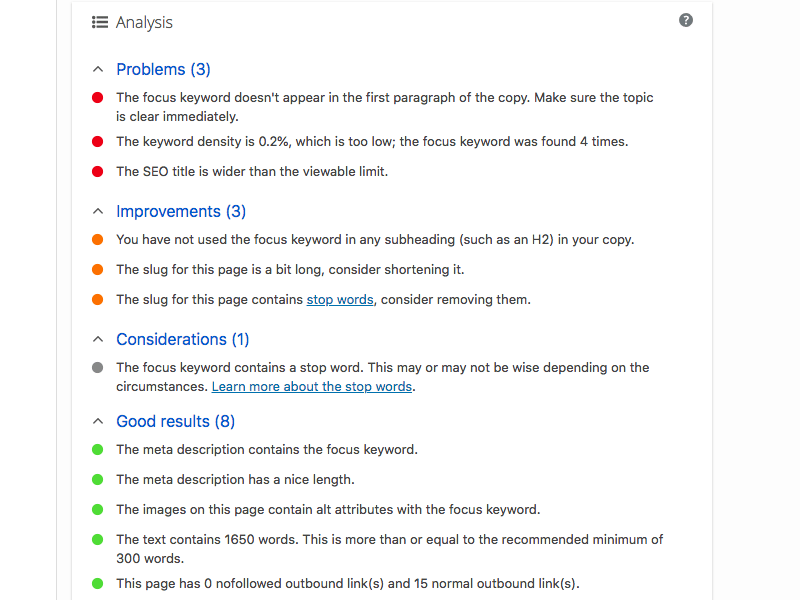 One of the biggest prose of Yoase SEO is the real time content scanning for both SEO and readability via the Flesch-Kinkaid score and provides insights for improving your content while you are creating it. Additionally, the full suite of bulk editing tools enables you to quickly optimize descriptions and title tags for exisitng content. 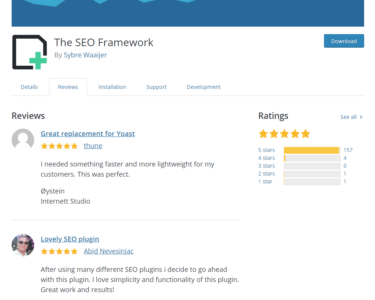 The biggest cons of Yoast SEO, are the sheer number of features combined into the plugin as well as the addition of banners and other notifications encouraging you upgrade to their premium or purchase training. The large number of features can make this plugin overwhelming to some users and occassionally means that some of the features are not as polished as others or that some optimization best practices aren’t followed. For example, the plugin doesn’t include any scanning of the sitemap for errors. With more than 3 million installs, All in One SEO Pack is the second most popular SEO plugin in the WordPress repository and is one of the best SEO plugins for doctors. The plugin has both free and premium versions that share many features and both make optimizing your medical site for search exceptionally easy. The primary benefits of the paid version over the free version are the premium support forums and video tutorials. Where Yoast SEO is seemingly all about covering as much ground as possible, All In One SEO Pack is more focused on offering a core feature set that with excellent ease-of-use. Additionally, where Yoast discourages a more hands-off, automated approach (e.g., meta descriptions) by requiring additional configuration, All In One SEO Pack is ready to go out of the gate. The addition of the premium support is also a boon for this plugin if you need the extra assistance. While All In One SEO Pack is generally very easy to use, there are several features that are not enabled by default, for example XML Sitemaps and Opengraph tags, and require extra steps in order to configure them. It also does not offer any kind of scanning for SEO scoring or content optimization. The SEO Framework isn’t as popular as the first two plugins, but it does have a growing fan base, who have been raving about it. It’s a free plugin available from WordPress.org’s plugin repository and offers a nicely lightweight presentation of options to handle the most common elements of SEO for doctors’ sites. It seems specifically designed to be there when you need it and otherwise stay out of the way, which is refreshing in a day and age where everything seems to be competing for your attention with notifications everywhere. The biggest potential con of The SEO Framework is that it presents its settings in one big list of options. While this certainly simplifies the management of the plugin—offering a single place to go for settings—it can be overwhelming to beginners. SmartCrawl Pro is very easy to set up. In fact, the company that produces it advertises a one-click setup, which applies their recommended settings. With a few more clicks you can quickly configure your own settings based on helpful guides for each of the settings. Once setup is complete, SmartCrawl Pro handles everything in the background and doesn’t require a lot of ongoing work to maintain your SEO. SmartCrawl Pro is a premium plugin that is only available as part of a subscription to WPMUDev. While the subscription is well worth $49 per month because it includes many plugins and themes, that can be a steep price to pay if all you want is an SEO plugin. SEO-Pressor Connect is a full-featured premium plugin designed to be as fool-proof as possible. The plugin takes you step-by-step through optimizing your healthcare site for SEO. It will help you optimize all the major pieces of sitewide SEO as well as elements of a single page or post. One of the best features is the automatic SEO scoring that allows you to constantly monitor how well you’re doing as well as provides recommendations for further optimization. SEO-Pressor Connect offers a full suite of SEO features and is regularly updated to take into account the latest changes in Google’s ranking factors. You won’t need to keep up with the 500+ updates Google makes per year and you won’t need to become an SEO expert; simply keep SEO-Pressor updated and it will ensure your healthcare practice site is in alignment with the latest best practices in SEO. The biggest con of SEO-Pressor Connect is that it is only available as a premium plugin. While priced at $9/month, which is quite affordable considering the feature list, several of the free options presented above offer many similar features as long as you’re willing to sacrifice a little ease-of-use. If you’re looking for the cheapest option, this will be a concern. WordPress is a great platform for your medical practice’s website. It’s already designed for good basic SEO and is easily extended to provide advanced optimizations. With the right SEO plugins to extend your site’s functionality, doctors can easily rocket to the top in search. 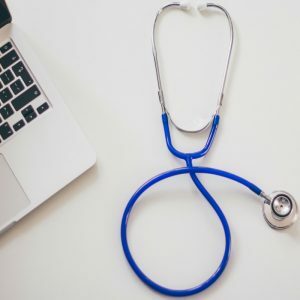 With the best plugins like the ones outlined here, doctors don’t have to become SEO experts instead relying on the step-by-step instruction and automatic optimizations to ensure their practice websites are SEO superstars. Not sure DIY SEO is the path for you? We’re here to help and we’d love to discuss medical marketing with you! Baker Labs specializes in helping medical practices grow by utilizing customized digital tools and strategies, including SEO. Contact us for a free marketing assessment of your medical practice, or for a free SEO audit of your website.